Reference number for this case: 10-Oct-54-Marseilles. Thank you for including this reference number in any correspondence with me regarding this case. The regional newspaper Le Méridional, of Marseilles, for October 12, 1954, reported that one of their readers living in Saint-Antoine told them having seen on October 10, 1954, between 11 p.m. and midnight, a shining object in the shape of a disc above the sea. The "craft" suddenly started at a very high speed towards the Southwest. 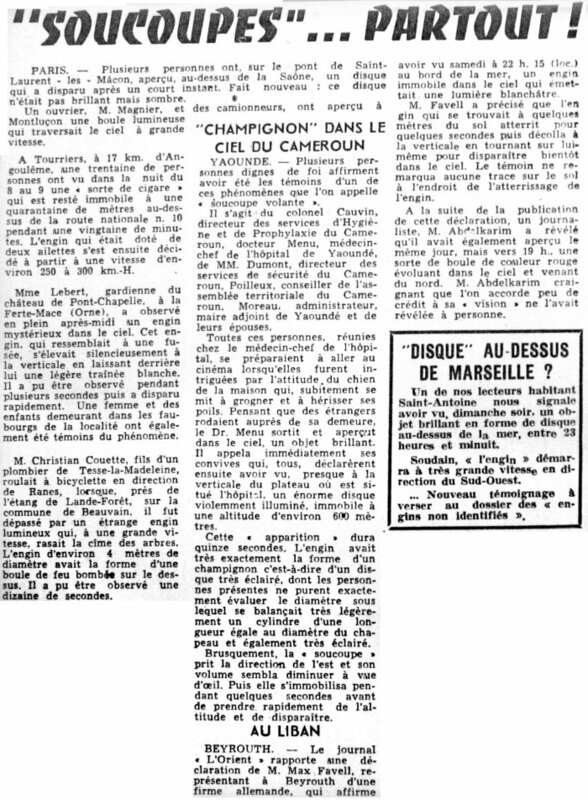 [lm1] Article in the regional newspaper Le Méridional, Marseilles, France, page 12, October 12, 1954. 1.0 Patrick Gross June 16, 2010 First published. 1.2 Patrick Gross April 20, 2019 Addition of the Summary.